You are here: Home / Essential OIls / Make Lemon Balm Lip Goo & Be Prepared For Fall! Make Lemon Balm Lip Goo & Be Prepared For Fall! Do you love the scent of fresh lemon balm? How do you make herb-infused oils? Also called Melissa, lemon balm has been used by humans for generations to support healthy skin. And this year, it’s completely taken over my garden. I planted two little seedlings, and they’ve grown to large, healthy plants. I’ve been harvesting and drying lemon balm CONSTANTLY. One of the best ways I’ve used to both preserve and use lemon balm is by creating infused oils. The herb is perfect for homemade salves, creams, lotions…..and lip balms. With fall just around the corner, you’ll want to have lemon balm in your cabinet to help with those dry skin situations. If you’ve never made an infused oil, don’t worry. It’s as simple as snipping 1-2 cups of fresh herbs and covering them with oil (I use olive oil, but almond, grapeseed, and avocado are also good options). Make sure the herbs are completely covered, and allow them to “steep” for 2 weeks to infuse the oil. (If the herbs get moldy or the oil smells or looks off, just toss and start again). You can cook with infused oils and/or use them to create DIY skin care products. 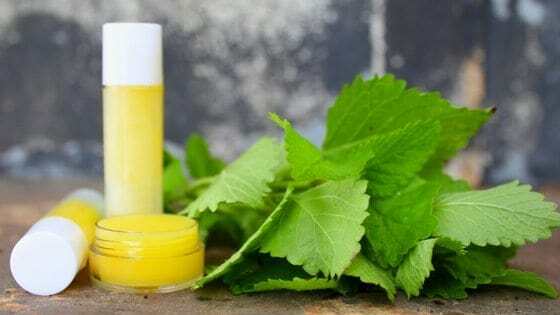 Here’s how to make your own lemon balm lip goo! This recipe makes 4 tubes or 1-inch pots of lip balm. Play with the essential oils to see which scents you like. The lavender gives the balm a floral, soothing scent, while the peppermint gives it a fresh feel. Like lemon balm, carrot seed is great for supporting healthy skin – use only one drop because the smell isn’t super pleasant (compared to peppermint or lavender). 1 drop gives you the power of the oil without sacrificing the lavender/peppermint scent. Lemon balm essential oil CAN be expensive, so it’s ok to leave it out. The lemon balm infused olive oil will be great for your skin. You can use any brand of essential oils, but I’ve done a lot of research and recommend Young Living oils. (You can get them wholesale or retail – you’ll save 24% if you get them wholesale from this link). Once your oil is infused with the power of lemon balm, you’re ready to make your lip goo. In a mason jar, combine all the ingredients. Make a double boiler by placing the mason jar in a pot of water. Heat until the beeswax is melted, stirring occasionally so the ingredients mix well. Once melted, use a funnel to pour the mixture into tubes or other lip balm container. Allow to cool undisturbed. The lip balm should be somewhat soft and easy to apply to your skin. Once the water is simmering, the entire recipe takes about 5 minutes to complete. Easy peasy lemon balm squeezy, right? Keep one tube in your car, one in your bag, one in a backpack, or wherever you think lemon balm might be needed. I like to keep a lip balm on my bed side table and put it on just before i go to sleep at night. My lips get dry at night if i don’t use it. I think i must sleep with my mouth open!